We spend a lot of time emphasizing the importance of safe driving on Arkansas roads. But in the summer, you may find yourself spending less time in your car and more time on a boat! It’s no wonder that many of us take to water to beat the heat; great getaways like Lake Hamilton, Lake Degray, and Greers Ferry Lake are just down the road for many of us. Spending time on the lake is meant to be relaxing, but unfortunately, many people apply that same sense of leisure to their boating skills. With more than 200,000 boats registered with the Arkansas Game and Fish Commission, there are a significant number of people on Arkansas water each day of the summer season. That’s why it’s so important to brush up on your boating safety knowledge before you hit the waves! Take a Boater’s Safety Course – and get certification. Arkansas, along with more than 40 other states, requires boaters to take an approved Arkansas Game and Fish Education Course before operating a boat on state waters. You can complete the course either online or with a classroom instructor. There’s an assessment at the end; once you pass, you’re able to operate a boat, including motorboats and sailboats. We took a look at the course material and trust us – there’s a lot to learn! Wear a Life Jacket. 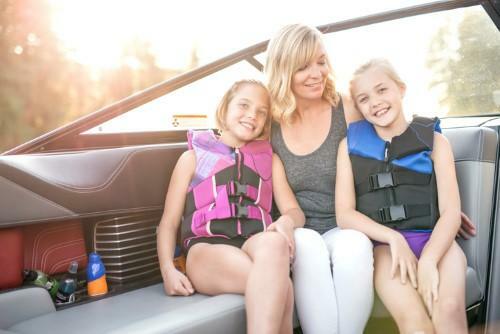 Arkansas law requires that anyone under the age of 13 wear a life jacket while boating, and all persons must wear life jackets while on a personal watercraft (like a jet ski). It also requires every boat to have a life jacket for each person on board. Drowning causes 7 out of every 10 boating fatality accidents, and 9 out of 10 drowning victims weren’t wearing a life jacket. Experts agree that wearing a life jacket is the best way to keep yourself and your loved ones safe around water. So why don’t more people wear them? The most common reason is concern over how they make you look or feel. However, the bulky orange life vests of years past are just that – past. Manufacturers now make life jackets in many colors, more comfortable and flattering cuts and fabrics, and multiple size options. It’s worth finding a life jacket that you’ll be proud to wear! Act Wisely about Weather. Keep a weather app on your phone and check it often. If bad weather is in the forecast, stay off the water, even if it hasn’t reached your area yet. Water and lightning don’t mix. This applies to all water activities, including canoeing and kayaking. Don’t Drink and Boat. Think of “drunk boating” in the same terms as drunk driving – it’s a serious offense. The state of Arkansas agrees; the penalty is the same for both. It is always illegal to operate or physically control (steer) a boat while under the influence of alcohol. Your first offense could leave you with up to a $1,000 fine, a six-month license suspension, and a year in jail – not to mention the risk you pose to other boaters and swimmers. If you plan to enjoy an alcoholic beverage on a boat, be sure that you will not need to operate it, even for a few minutes. Learn to Swim. Whether you’re 3 or 33 years old, it’s (almost) never too early or late to learn to swim. This is one of the most important steps you can take to ensure your safety while near water, whether on boat or on shore. Many local pools offer swim lessons, and private instructors often advertise their services. Find a swim instructor near you today! Whether on land or sea, the personal injury attorneys at Taylor King Law take safety seriously! We hope these tips will help keep your family safe as you soak up the Arkansas summer sun. Were you the victim of a car or boat accident where another person caused your injuries? You may have a legal claim for compensation. Call today at 1-800-CAR-WRECK to begin your FREE consultation with Taylor King. You can trust our experience Arkansas injury lawyers to be On Your Side, By Your Side.